Today we met Jamie Robinson, a Process Engineer at Suncor Energy in Denver. We learned about how chemical engineers design and build systems for chemical production on a very large scale. Our hands-on challenge was to design a "mini popper" that exploded in exactly 2 seconds. 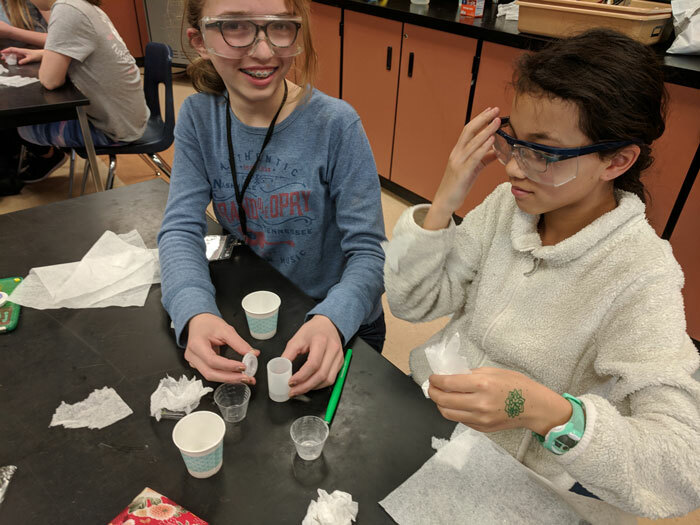 After learning about the chemical reactions that occur when mixing vinegar and baking soda, we put on our chemical engineering hats to figure out just the right mix of ingredients to accomplish the goal. There was in fact no "right" answer, but many possible combinations! Today we welcomed Sarah Sasse, a molecular biologist at National Jewish Health, who uses cutting-edge genomics-based tools to understand transcriptional regulation by glucocorticoids in healthy and diseased airways. She shared her incredible career journey and then led us through a "human genome scavenger hunt" using an online genomics tool that she and her colleagues use on a daily basis! Today we got to meet Lynn Riemer, an experienced forensic chemist, illicit drug expert, community advocate and prior member of the North Metro Drug Task Force in Colorado. We learned all about her extraordinary experiences in the field, and the major role chemistry plays in solving crimes. Today we got to explore the intersection of graphic design and technology, using digital design tools to create our own business cards. Then we met Justine Henderson, a Denver-based designer and photographer, who inspired us with her story and career. Once you've got the hang of those, click the Canva logo at the top left to return to main page and click Create a design. Then choose Business Card. A front and back design. Click +Add a new page at the bottom to add a second canvas for the other side. Today we continued making our own pressure sensors, which control the brightness of an LED by how hard the sensor is squeezed. Once we finished building the sensor circuits, we attached them to foam stress toys to create our own pressure sensing, light-up stress toys! We also learned that circuits don't always work on the first try, and how to "debug" them. This is an important part of the process! In the words of Thomas Edison: "I didn’t fail 1,000 times. The light bulb was an invention with 1,000 steps." You can find full instructions at the link below, in case you'd like to try again or make yours even better. Today we met the amazing Michelle Mellenthin, a biomedical engineer and post-doctorate researcher. We learned about her experiences with Engineers without Borders and her current research on technology that helps damaged lungs function properly. We also talked about the use of sensors in biomedical engineering and started making our own pressure sensors! We will finish making our sensors at the next meeting on Dec. 12, and continue our exploration of electronic circuits by making festive LED ornaments. We had a blast meeting each other and creating Trashin' Fashion – designing with upcycled materials and a "STEM" theme. Welcome to the new Campus Middle School Blog!